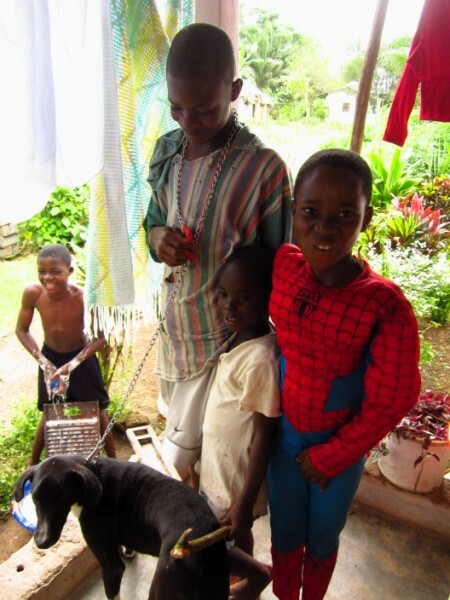 Titus liked to wear his Spiderman suit on Sundays after church. Today was a good day, but I miss my family. Both of them. My America family is out of town and I haven’t talked to them in over a week. My Kakata family is going on without me. Everyone will be long since in bed by now. The kids will have all done their chores and had baths. Maybe they watched a show. Maybe they colored and read books? I miss my Ma’s cooking. I miss the hugs, and laughter, and games. I miss being called Auntie Leela and having the whole neighborhood know my name. I miss the quiet and the dark and the privacy. My new room is on the corner and has two windows. One is about 20 feet from the pump. It looks almost directly into the CEO’s back door. I don’t have curtains up yet. A path runs directly through our back yard and last night I could hear people passing until late. Their voices right outside the window jolted me awake. At some point a mouse came in and started going through my things, even though all the food was packed up outside. Tonight I remembered to shove a lapa under the door to keep him out. Next door the CEO is running his generator. They kept it on last night until at least 3:00am when it ran out of gas and sputtered to a halt.